Mark Andrews, Scott Safety’s product manager – Air Purifying Respirators, offers a guide to setting up a successful respiratory protection programme. There are a number of reasons why people are required to wear Respiratory Protection Equipment (RPE) including compliance with workplace procedures/policies in accordance with applicable safety regulations. However, there are also reasons why some choose not to wear RPE, such as limited access to equipment, discomfort factors, interference with other Personal Protective Equipment (PPE), a lack of awareness of the risks of not wearing RPE in certain situations and inadequate guidance for its selection. Developing a successful RPE programme can help employers comply with the law, protect and educate their workers in the need for RPE and facilitate tracking of the effectiveness of deploying RPE across a workforce. An effective workplace risk assessment will identify all factors potentially hazardous to health in a particular work situation. In terms of respiratory hazards, it will recognise potential threats arising from environments Immediately Dangerous to Life or Health (IDLH) such as oxygen-deficiency and the presence of acute respiratory toxins. It will also consider the threat from combinations of respiratory hazards such as mixtures of dusts, fibres and gases. Typically, to quantify risk in relation to respiratory hazards, a ‘hazard ratio’- the ratio between the airborne concentration of the hazard and its workplace exposure limit or Control Limits- will be used. RPE type with a protection factor greater than or equal to the hazard ratio will then be selected to ensure the wearer is not exposed to the hazard above its permitted exposure limit. Selecting appropriate RPE for protection in a hazardous environment requires a thorough assessment of all hazards present. A clearly defined process must be followed to determine the type of RPE to be used for the work task which could include breathing apparatus, filtering masks, powered air respirators or continuous flow airline systems. Clarity in the process for determining workplace hazards and selecting PPE is essential. The UK’s Health & Safety Executive (HSE) has published advice in its HSG53 document detailing the assigned protection factors offered by various types of RPE. 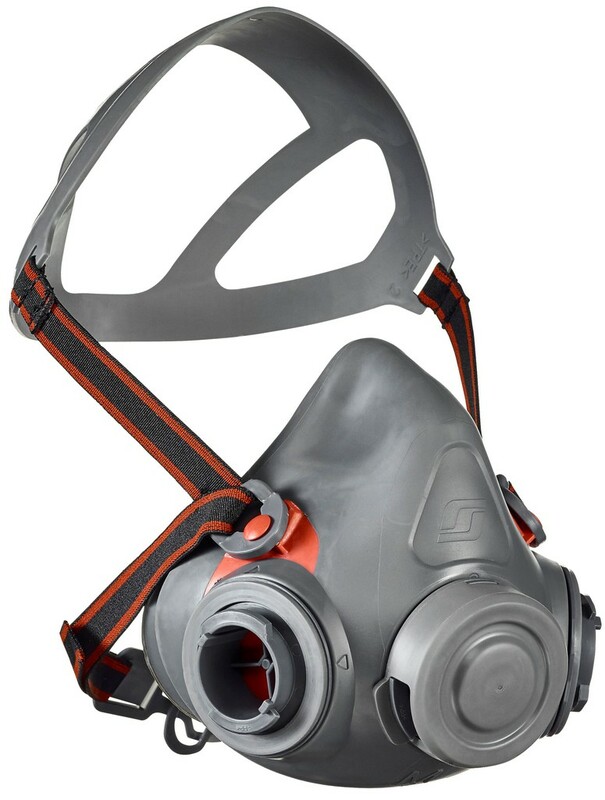 Air-purifying respirators, as opposed to Self-Contained Breathing Apparatus (SCBA), utilise filters for the removal of hazardous airborne contaminants. With many different types of filters available, selecting the correct ones can sometimes be confusing for those unfamiliar with the selection process. Scott Safety’s experienced and highly trained team of scientists and technicians are on hand to assist you with guidance on appropriate selection for a range of hazards to make an educated decision relating to RPE selection. Quality of a respirator’s fit to a person’s face is critical to the level of protection it will afford against a hazard. HSE’s HSG53 document provides general advice on RPE selection. Once selected, however, fit testing by a competent person is required to ensure that a respirator assigned to an individual fits properly. As people come in all shapes and sizes, manufacturers typically offer various sizes of the same respirator type so that an adequate fit can achieved for most people. A means of proving their competency, RPE fit testers can be accredited under the Fit2Fit RPE Fit Test Providers Accreditation, developed by the BSIF in conjunction with other industry stakeholders- a scheme fully supported by the HSE. Innovations in anthropomorphic product design (study of human facial characteristics), the use of advanced materials and features have enabled manufacturers of RPE to increase the proportion of population a respirator fits. For example, the new AVIVA half-mask from Scott Safety utilises an innovative reflex seal design which reliably fits a very high proportion of the global population and remains comfortable for the wearer over long durations. Its integrated positive fit check device allows the wearer to check periodically throughout the working shift that the seal is maintained. Employers are expected to provide training for their end users in general RPE use and specific use instructions for their RPE. Manufacturers assist by providing training aids both in physical copy and online. Manufacturers also provide training services, including certification where the level of protection selected requires it, such as with Breathing Apparatus. RPE must be inspected and maintained on a regular schedule and stored properly to prevent damage and contamination. Manufacturers’ product user instructions will provide details on how this should be done. An effective RPE programme is likely to provide a suitable area for cleaning, maintaining and storing RPE between uses which should be a clean area away from the workplace hazard. Enclosed lockers or boxes with a suitable hanging facility may be appropriate depending upon the RPE concerned and its application. If filters are to be re-used they will usually be removed from the RPE, stored in a plastic bag/box in a clean, dry environment away from contamination. Other parts of RPE that are either washed or wiped clean need an area to dry naturally before being stored. In some instances, depending on the type of chemical hazard, filters must also be changed out after each shift. Applicable regulations should be consulted in relation to this. Technology is continuously progressing with new products available every year. It is therefore important to consider the latest innovative products in your respiratory selection programme. A versatile range of ergonomically designed RPE from trusted manufacturers is available on the market. Equipment can vary from disposable respirator types through to re-useable respirators fitted with replaceable filters and powered air systems.